(Photo credit: Tom Hogan/Golden Boy Promotions) Reporting live from the StubHub Center in Carson California, Lucas Matthysse took on Viktor Postol for the vacant WBC Junior Welterweight title. 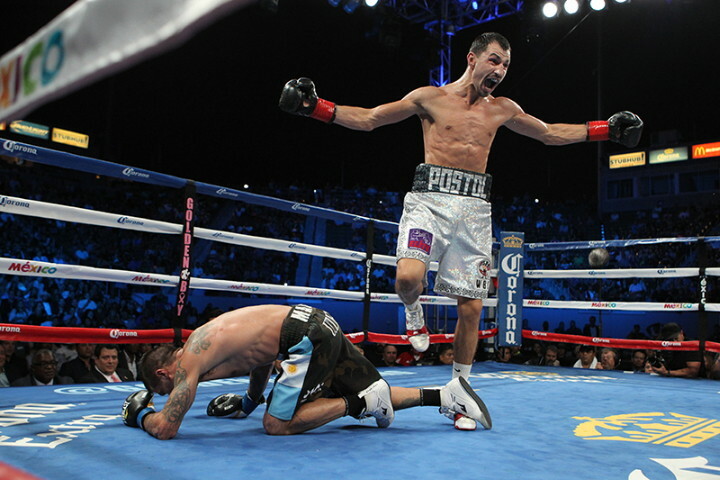 Although not many were familiar with Postol before the bout, he certainly made a name for himself tonight. The arena was packed with fans chanting “LU-CAS, LU-CAS” as the the fight began in the center of the ring. The Argentine marched forward stalking the untested Postol trying to overwhelm him early with powerful left hooks upstairs followed by straight right hands. Postal weathered the storm by covering up, attempting to block most of the punches and moving backwards away from Matthysse’s power. During the second round the much taller and longer Ukranian used his height and reach advantage to box from the outside, establishing a sharp jab and using excellent footwork to move out of range every time Matthysse approached. From the third round on it was becoming clear that the Ukranian was simply too big for Matthysse to box with. Postol demonstranted not only that he was the bigger man but that he also possessed elite level boxing skills and ability. He stayed on the outside and slipped in sneaky straight rights flush to Matthysse’s face earning his respect. This is probably why Hall of Fame boxing trainer Freddie Roach decided to take on the almost unknown but talented fighter. Postol found his rhythm and through round five was dominating the fight by controlling the distance between the two men. It was obvious that from the outside he could effectively use his height and reach to hit and not be hit, score points and win rounds. What was most surprising and impressive was that he was the better fighter on the inside, landing solid combinations in close range on Matthysse, discouraging any offense that the Argentine tried to start, and tying up when necessary. The tide changed a bit in the sixth round as fans began chanting again “LU-CAS, LU-CAS”. This seemed to motivate Matthysse as he pushed forward now closing the gap between the two and landing a series of crushing overhand rights, sending the wobbly legged Postol around the ring. You could feel in the atmosphere that a shift in momentum was taking place to Matthysse’s favor. His power was now getting through and seemed to bother the less experienced Postol. Would he be able to handle the punching power of a known knockout artist? Matthysse continued to come forward with a solid offensive attack of left hooks and roundhouse right hands. However by the eighth round his pace dropped significantly and he appeared to tire. Postol had gotten his legs back and reasserted himself as controller of the fight by boxing intelligently with his height and reach. Again displaying his supurb boxing skills, defense, and chin, he dominated landing almost at will as Matthysse seemed to have no answers for what Postol offered. For such a big man he was surprisingly elusive, slipping most of Matthysse’s power shots while landing his own flush combinations, then circling to the left (and occasionly right) to slide out of range to not be countered. By now many questions regarding Postol had been answered, does he have a chin? Can he box on the outside? On the inside? But we had yet to see if he has real power in his punches. Enter the tenth round. Matthysse looked visibly tired and confused as to how to get himself back into the bout. The younger, fresher fighter took his time to set up what would end the fight, a beautiful crisp lead straight right that folded Matthysse to his knees. He would not get up for the count. And just like that a new star was born. So what is next for the nearly 6 ft junior welterweight titlist? The future is wide open, there are many options but most boxing fans would agree a unification match between title holder Terance Crawford would be an outstanding fight. Both men have shown that they possess elite boxing skills and knockout power. One can only hope that these two square off in the ring to establish who is the best 140lbs fighter in the world! As for Matthysse the future does not look so bright. He is most likely on what is the tail end of his excellent career. He didn’t resemble the same fighter we’ve known from the past. He was slower tonight, his once concussive power wasn’t there, and by the end of the contest he was a broken man. Matthysse should feel no shame though, he’s entertained millions multiple times and has well deserved fans around the world. He can hold his head high knowing he gave his all every time. You are here: Home / Boxing News / Hello Viktor Postol!! !